Every weekend there are about 44,230 weddings across the country, meaning there are 88,460 people celebrating the happiest day of their lives. There is so much that goes into planning a wedding, which is why some couples decide to go all out. If you’re in the process of planning for this special and hopefully unforgettable day, then try your best to plan not only for the day itself, but the entire weekend. A weekend of celebration with your closest friends in the world and all of your family will truly be the most amazing time of your life, so do your best to make sure it’s absolutely perfect. Here are a few great ideas that will help you plan the perfect wedding weekend. Remember: the key to a great wedding weekend is a great wedding! If you and your guests have a blast at the reception, the entire weekend will seem that much more special. In fact, the entire weekend should be organized around the reception, so make sure you’ve booked the ideal venue for the festivities. As long as you have a beautiful banquet hall for your wedding ceremony and reception, you’re going to be as happy as ever during the entire weekend. Choosing a wedding venue is one of the most important decisions you will make for your special day, but as long as you find a great place, you’ll have the perfect wedding in the perfect place. Perhaps you want a banquet hall with more of a rustic setting? That’s absolutely doable — just make sure you know where to look. A lot of couples worry too much about the rehearsal dinner and end up ruining the night before the big day. 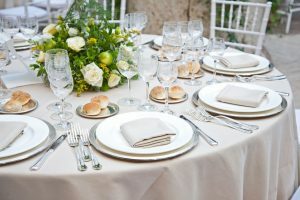 Although the rehearsal dinner is certainly important, especially if you’re planning a grand wedding with a lot of people and responsibilities, you don’t have to spend much longer than an hour or two going over everything. You selected your wedding party for a reason, so hopefully you know that they are more than capable of understanding what they need to do during the wedding itself. Once you go through a practice wedding run and go over all the logistics of the big day, it’s time to bust out the food and enjoy the rest of the night. Especially for destination weddings, many people will be tired and possibly jet lagged from traveling, so don’t let your rehearsal last all night long. This is your chance to spend time with your best friends in the world for one special day before you’re finally married. Enjoy it! As long as you’re considering these few aspects during your wedding planning process, you’ll likely have the perfect wedding weekend. Keep an eye out for part two of our series on how to have the perfect wedding weekend! Also, contact the Woodfire Lodge to learn about a great wedding venue in Wisconsin, one that might be perfect for your special weekend.